Lady Alston died aged 44. 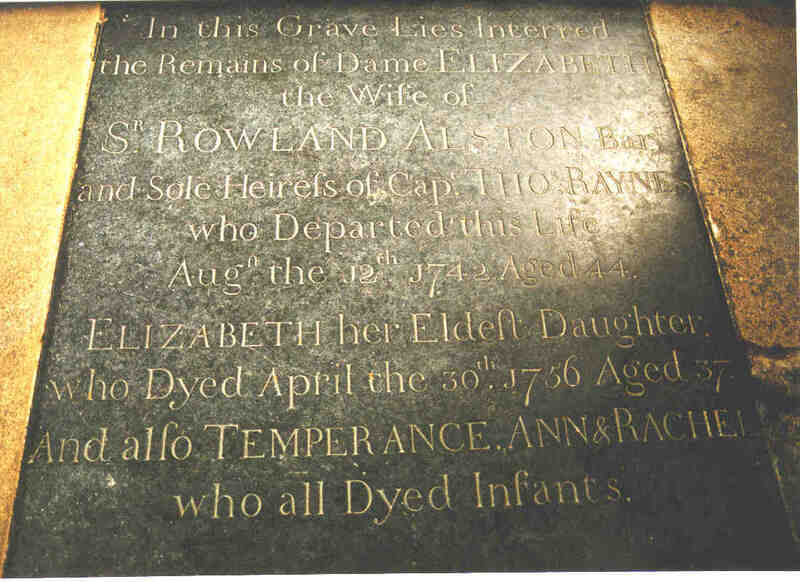 She is buried under a black ledger stone to the right of the altar in Odell church inscribed "In this grave lies interred the remains of Dame Elizabeth the wife of Sr Rowland Alston Bart. and sole heiress of Capt Thom Raynes who departed this life Aug 12th 1742 aged 44"
Dame Elizabeth Alston - on the 1st December, 1742. Administration of the Goods, Chattels, and Credits of Dame Elizabeth Alston late of Odell in the County of Bedford deceased was granted to Sir Rowland Alston Baronet the lawful Husband of the said deceased being first sworn duly to Administer.